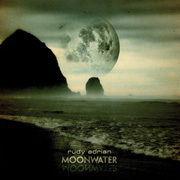 With MoonWater (63'26"), Rudy Adrian celebrates the touching and easy moods of environmental musical fantasy. This work hopes to take the listener out of the real world, with all its uncertainty and isolation, and into Adrian's personal Eden. The nine idyllic compositions are quieting to the mind and envision a harmonious and tame nature. Adrian unitizes a number of interesting methods to portray and convey his convictions including, native flute, field recordings, lilting piano melodies, pleasant synthesizer tones and his own voice, all routed through cavernous reverberation. The grandeur of MoonWater's consonant harmonies is grounded by detailed and imaginative electronic modulations just beneath an aural glow which seems to surround each composition. The result is beautifully flowing and transporting music, contemplative for the mind yet warming to the heart.